"This town exists by virtue of Tam Coc (karst mountains) and is within cycling distance. Well off we went! On somewhat rickety brig choose who just were not too small easy peasy, the highway. It is different biking, between the heavy traffic and no visible traffic, with a surface which has had its day. However, we are already a little used to it and the bike went well, we even arrived without delay at Tam Coc. With a small boat whose rower with her feet paddled we entered the water. In the books we were already warned of far-reaching 'tourist traps' but it was still quiet so early. A little later arrived the day trips from Hanoi, then it is very busy. The cruises was totally worth it, through the karst scenery, caves, very very nice (yes, you have to go north, don't forget it!)." 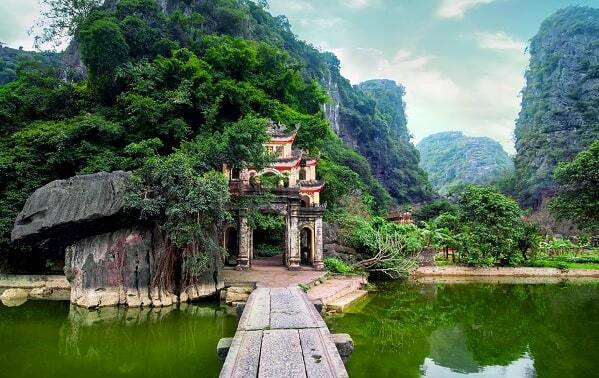 Ninh Binh - is famous for the nearby karst scenery around the village of Tam Coc. There is nothing to do in Ninh Binh itself apart from drinking beer with the locals; the city is more useful as a base for the surrounding countryside. Ninh Binh is on the way to the south, when you depart from Hanoi (97 km). It is worthwhile to spend a few days here. Regular buses from Hanoi, departing from Giap Bat bus terminal in the south of the city. The drive to Ninh Binh takes about 3 hours. Buy your ticket or in the departure hall and not on the bus. You'll probably have to pay more if you get off the bus because there are too many tickets were sold and the bus is full. If you're travelling by train (Reunification Express), Ninh Binh is one of the stops. The train usually stops only briefly, because there are few travellers step on or off. Also, the Reunification Express arrives late at night in Ninh Binh. Do not miss the stop and get off very fast! One of the most spectacular sights of Vietnam is Tam Coc. 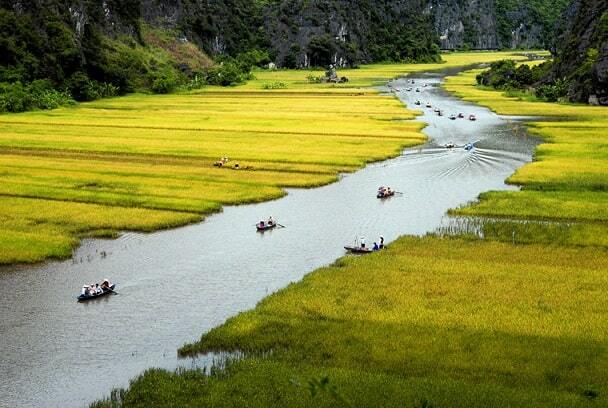 This is a beautiful landscape of the karst mountains of Tam Coc, where you will be rowed through by Vietnamese women. Try to get there as soon as possible to the boat before the tour groups come from Hanoi. Otherwise, go late in the afternoon, after the tour groups have left. The last boats leave at 17:30 in summertime and 16:30 in wintertime. 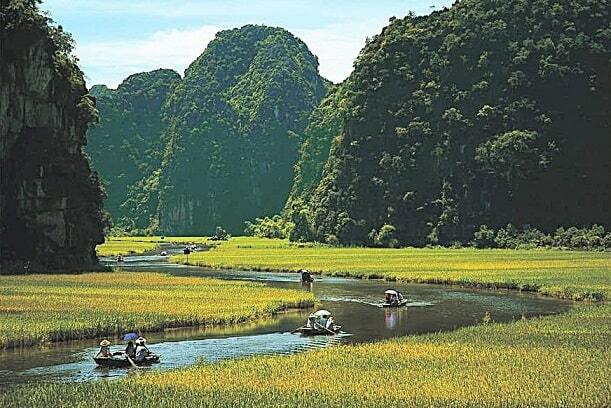 The Vietnamese women's are rowing with your hands and feet through the idyllic and delightful scenery of Tam Coc. You'll travel in a crystal clear river, where you can look down to the bottom. You sail under natural tunnels and along the many rice fields. There are also floating beverage vendors, which can be very persistent. Most will ask you whether you want to buy a drink for the rower. This drink is usually immediately sold back for half the price. Some boats have loaded boxes upon departure. They are filled with handicrafts (you can check this), and it is intended that you buy from. Rowers are poorly paid with a minimum wage. They do have the right to make a few tours a week for themselves. So buy something handmade, famous Tam Coc embroideries. It is the main income for the local population. You are not obligated to buy anything, but you have the rower give a good tip. But do not expect thanks. Usually they complain that it is not enough, no matter what amount you give them. The area around Tam Coc is equally beautiful and you can easily bike. At Tam Coc, there are two beautiful places to visit: Bich Dong Pagoda, 3 km from the Tam Coc Pier. The pagoda park is centered around a monumental statue of "Uncle Ho", built on the cliff, where you have a fantastic view. The other spot is the Tai Vi Temple, which are accessed by a small road on the right side of the pier. "We did not necessarily buy the souvenirs pushy saleswomen but they've still got hold of us, when we returned the bikes both front tires were empty. Fortunately there was a bicycle which in turn pumped the whole thing for a few pennies! Right through the countryside we cycled on, it was not very sunny but very hot and super soggy, rainy season, you know. Hoa Lu was also very nice, a few temples of kings from a far and distant past. Then we went back, it got darker and darker, I've already put my stuff in the waterproof bag in time and yes, there began to fall pouring from the sky. We have to wet rained on our skin. However, it was not cold and the polder residents let themselves not by a 'rain shower' from hitting the field."